The 'Grammar Vigilante': Defender Of Truth, Justice And The Grammarian Way : The Two-Way Wielding his handy "apostrophiser," this "Banksy of punctuation" stalks the streets of Bristol at night, reclaiming the British city's street signs for good — one corrected apostrophe at a time. 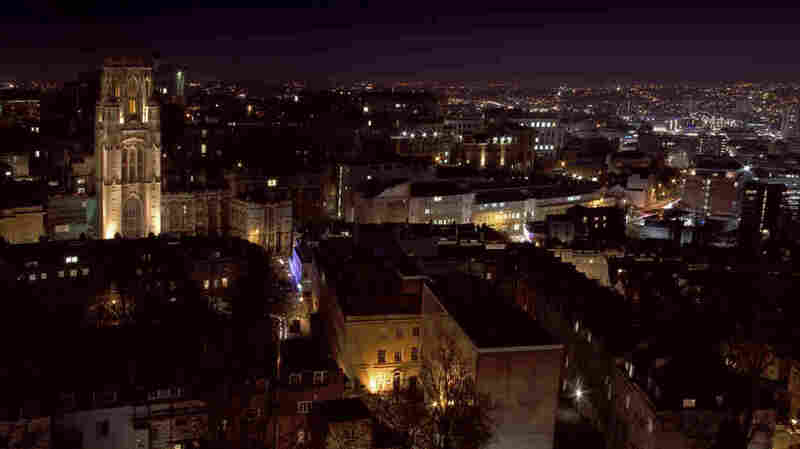 The Gotham of the "grammar vigilante": Bristol, U.K. The campaign began under cover of darkness. It opened with a skirmish or two in Bristol more than a decade ago — a superfluous apostrophe scratched off a street sign here, a possessive rendered plural with the stroke of some tape there. But now, the battle between one mysterious man and the grammatical mistakes besieging the British city has spilled into the harsh light of international media. The BBC says it has discovered the identity of the "Banksy of punctuation" — a mild-mannered engineer by day, who by night transforms (presumably in a telephone booth) into the intrepid superhero of sentences everywhere. The network will not reveal his identity, but it says he has allowed reporters on something of a ride-along, to watch him as he moves from sign to sign to put apostrophes in their proper places. "I'm a grammar vigilante. I do take it to heart — I think it's a cause worth pursuing," he told the BBC, in a documentary called The Apostrophiser airing Monday on BBC Radio Four. The documentary borrows its name from the man's device of choice: the long-handled "apostrophizer," which he uses to reach otherwise unreachable surfaces ... and apply tape to them. With it, he can add or cover up apostrophes that have lost their way. As soon as the documentary was announced, people around the world stretched out their arms in relief and celebration — by immediately addressing the masked man with requests to come fix the local mistakes that have been plaguing them. "Grammar vigilante" even began trending briefly on Twitter in the U.K.
To paraphrase The Dark Knight: You either die an apostrophizer, or you live long enough to see yourself be apostrophized.